To be honest and fair, when the finalists of this year Byblos Bank photo award were announced, and considering how closely I follow the event, reactions started to get me - from the indifferent "meh" to the nasty "so this is considered competition level these days?". Being a university lecturer, I know it sometimes happens, you have vintage years with brilliant elements followed by others where the crop is meager. Perhaps is was display error, after all - unless one is Steve McCurry - it is difficult to judge a full body of work from one image only as it was done when announcing the finalists. Among the said finalists was a project about the oldest people in Lebanon by the person who ended up being the winner - Joe Ghanem. It was conceptual for sure, but sort of lacked the shiny luster. 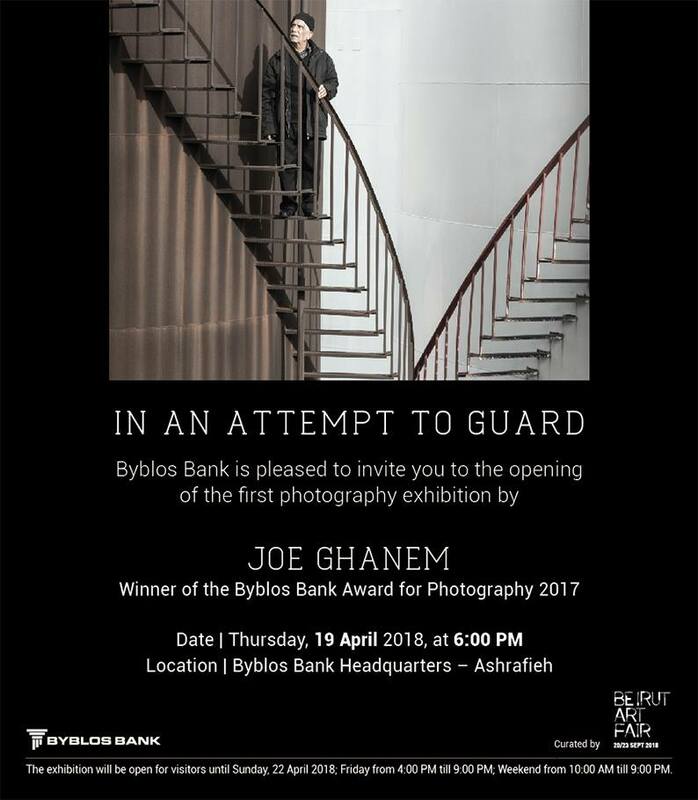 Still, internal sources from Byblos warned me that Ghanem did a spectacular job at the "Junctions" workshop headed by photographer Aurelie Perel (which was offered to a selection from the previous and current contestants of the Byblos Bank Award) and that he was a talent to watch. So when the invite to the customary solo show at the Byblos headquarters landed in my inbox with the title "in an attempt to guard"- the full puzzle fell into place: The name of the show, the concept, that image of a frail elderly guard heading up the stairs seemingly from nowhere and heading towards nowhere, the perfectly understated composition of the image, that sense of melancholy and loss but also dignity that engulfed the character - all of them simply showed an incredible talent at work. Ghanem, in person, is genuine, certainly excited about the whirlwind he is engulfed in (not just opening a show but also selling two editions of the same image - the one featured on the invite card - "and a third on the way, out of seven" he beams), obviously has time to go to the gym judging from his physique, and despite his youth, seems assured as to what he wants: "I started out as a business major, did two years, discovered I hated it, then switched to photography. Only one course was transferred. And now I am at my last year of photography" - actually, Ghanem is the third winner in a row who gets to be a third year student from NDU. Like the two previous winners, he intends to add photos to the existing show and present it as final year work at university. Without throwing shade on any of the previous winners, all of whom presented solid work at their solo exhibitions - Ghanem surpasses them all to be honest. He excels in terms of showing characters, but also showing what remains of them when not in the frame - a medicine box, three Virgin Mary prayer cards, hands of a man with a remote control. Mundane, daily acts, filling a time to steer away from boredom. In one of the images when you look closely, the feet of the security guard in question are titled just a tiny bit - which is a defensive gesture rather than an aggressive one related to how one normally perceives security guards. "That man specifically, when we first met he was missing a medicine so I went out and got him the medicine. We are still on very friendly terms. The one over there (pointing to another image) still waves when he sees me". Apparently Ghanem got zero cooperation from the security companies so he had to approach every guard separately, facing rejections, building trust step by step so as for the subjects finally agreeing to be featured in the photos. "What interested me was noticing that, security guards were old men, so I assumed they had keep working because they had no medical coverage, or that they are in dire financial situations for them to do it - I think I am drawn to the topics that no one talks about" eventually says Ghanem. Ghanem has dreams of being exhibited abroad, knows he is in it for the long haul, "I started out in events and fashion but noticed that documentary photography interested me much more" - so he wants to keep the day job but still further probe where this road takes him. 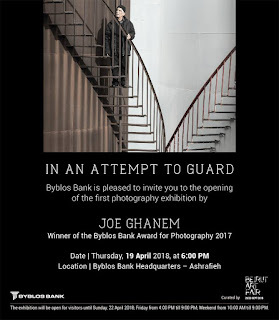 It is a pity that Ghanem did not use the very affable guards at the entrance of the Byblos Bank HQ somehow in the exhibition - this would have made the concept go full circle. Still, even without this, the exhibition rests on its own solid merits, a calm but powerful set of photographs (and a small installation) that show a talent already formed - and thankfully, starting to get noticed.